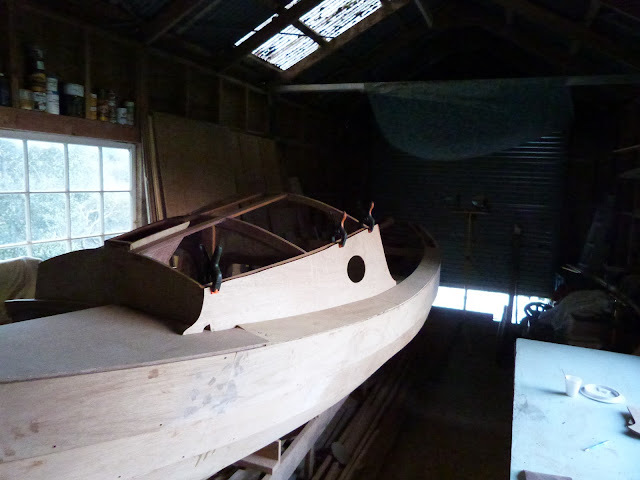 jwboatdesigns: Boatbuilding is a good thing to do when its raining. I'm looking for some tinned marine grade wire so I can run all that where I wont be able to get at it later then the "tops" go on. I like this stage of a build, it feels like a boat and its personality begins to appear. Found the wire by the way, it turns out that its not as uncommon as I thought. JA Russell electrical wholesalers will get it in, twin core covered, comes in a 30 metre roll. Why not mount a compass under the end of the seat? You probably would want to extend the seat a little and you might have to relocate the access hatch (which could be a bit of a pain). Knowing me I'd end up tripping on the compass box as shown.. I want it easily visible from all possible helm positions, this boat has a cockpit 3.3m long, thats 11ft, and I prefer the compass to be on the centreline so the parallax issue is the same on each tack. I'd have preferred a flat glass grid steering compass but haven't been able to find one second hand. This one is a 5inch Saura with all the trimmings so I can dial out a lot of the variation, has internal lighting, card damping, tacking lines and everything, it'll do nicely. 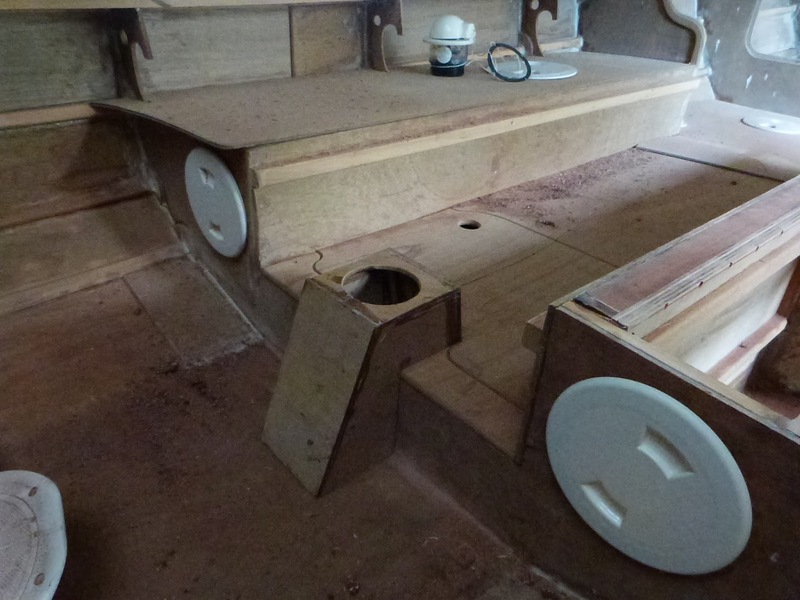 The other thing about that location is that the compass box is also the support for the rowing foot braces, those being on the centerline allows me a little more length for stowing the oars along the seat fronts. That makes a lot of sense. I was thinking that most of the time you would be steering from the rear section; however, it will be handy to be able to see it when rowing too. And, oh boy, hasn't it been raining? And an icy wind to boot. Roll on summer. I envy you your progress, John. I seem to get slower and slower. Your new build looks so cute and amazingly roomy. Annie. I've been following your progress since you started. In my experience, things seem to slow down as you get closer to 'the end'. 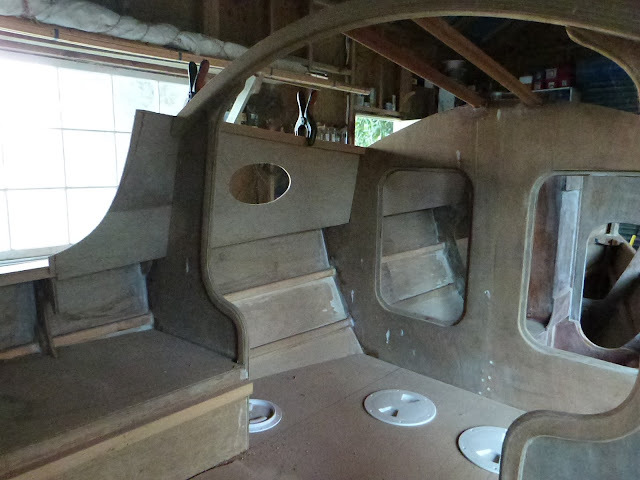 You work more on little details & tasks and there are more and more of them... You have a beautiful boat in the works, I look forward to seeing your updates - from my point of view, you are making good progress!